In support of Cyndy Hayslip! Team Triumph has received $3177.00 in donations! Team Triumph has not set a funding goal for their team. 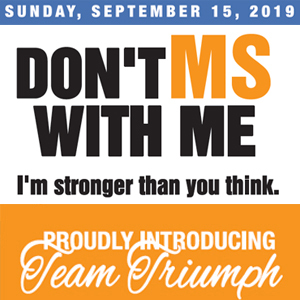 Why We're supporting: Team Triumph will show everyone what it means to be Stronger than MS! We are proud of their efforts to support those who cannot fully pay for their care and treatment. So we say, GO TEAM TRIUMPH! We are with you every step of the way!